The following list is a compilation of various websites that offer valuable resources for parents, students, and special educators. A brief summary is given, followed by an outlined list of the contents of each website. 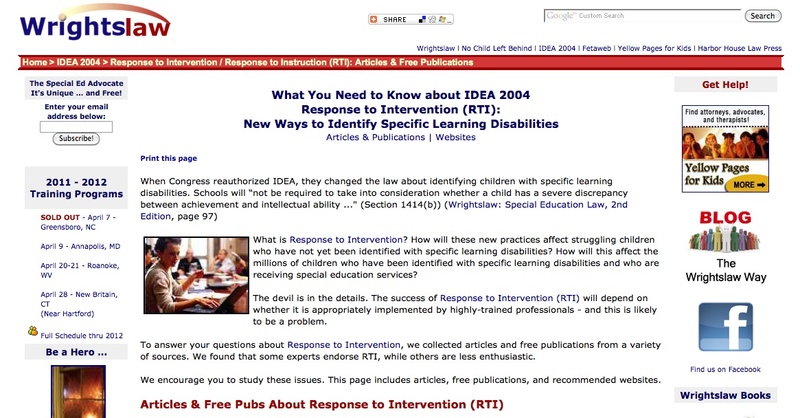 This website offers a comprehensive discussion of special education law including writing IEP’s, the process of filing complaints and recent legal issues and decisions. It also provides a section for parents to find resources for their children and a yellow pages link. This website offers state-by-state resources for children with disabilities. It also offers general information including developmental milestones for children, categories of disabilities, and information about education laws. This is an important resource for people going into special education as it deals with the IDEA act, its regulations, and upcoming events and amendments. This website provides important information about autistic children, laws regarding their education, and articles about research centers and resources available for parents of autistic children. This website provides information through programs designed to teach parents and teachers about learning disabilities. They host events and have various publications on latest research and laws regarding children with learning disabilities. This website provides links and free software and lesson plans for special educators who teach the basic skills. This site provides resources for children with special needs, including picture communication cards, songs, and games. This website provides an interactive learning guide to disabilities for parents, teachers, and children. They offer many resources including articles, research, chat rooms, and other resources to help people with special needs. This website offers resources such as articles about current research, assessments, teaching methods, and resources for teaching kids with dyslexia. There are also discussion boards and an advice line to further assist teachers. This website has various links to camps and programs designed to help kids with special needs. It also includes a directory of professionals who assist the learning disabled community. This website provides products for students with special needs aimed at helping them develop cognitive skills through activities that help develop concentration, spatial orientation, visual and auditory memory, verbal comprehension, and vocabulary. This website provides information about recent research on learning disabilities as well as a network of resources for parents and teachers. They have conferences and local chapters that offer their own resources depending on the state. This is a website that provides links to other websites that provide valuable resources for parents and educator’s of children with special needs. Children with Spina Bifida, Hearing Loss, Down Syndrome, etc. 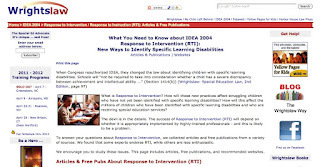 This website is a branch of PBS.org, and provides articles for teachers and parents of children with learning disabilities on topics such as effective teaching strategies for children with disabilities, augmentative communication, assistive technology, and links to other sites. This website provides resources for students who cannot speak or write. Their resources include things like electronic talking boxes, books and boards with pictures or sign language. This website provides information on this association which works to educate teachers and parents on how to improve support of children with learning disabilities through the implementation of positive behavior support. This support is based on strategies that focus on rewarding positive behavior. They have forums, conferences and publications devoted to this end. This website has a free download of a program that shows direct links to sites that provide online games and activities for children with special needs listed by grade level. This website is a service provided by the Division for Learning Disabilities and provides resources for teachers of students with learning disabilities. It provides articles and research about assessment, instruction, and curriculum based measurement for monitoring student progress. Resources such as publications, alerts, information on various assistive technical centers, and databases. This website provides a variety of free printouts, web links, and games for teachers of special needs students. There is also free software downloads in areas like math, communication, using computers, the arts, and science. This website has many links to other websites that provides resources for special educators.